Thank you for participating in Dogs Change Lives! Thank you to everyone who posted stories and voted in our Dogs Change Lives contest! Each story is such an inspiration! We've read about dogs that have alerted their families to fire, dogs that have helped their owner recover from illness, dogs that have stuck by their owners during rough times, and dogs that have changed people's lives just by being their cheerful, loving selves. We hope you enjoyed reading these stories as much as we did! Voting is now closed, and we are currently tallying the votes. The story with the most votes will win $1000, but we're also giving away plush stuffed animals to the 10 runners-up. Our judges are also reading the stories and they will select the most compelling story of a dog that has changed a person's life. These story will win the $500 Life-Changer Award. We will announce the winners later this week. Even though the contest is over, we invite you to go back to DogsChangeLives.org and read the stories. Our lives have changed from reading them and we're sure you'll find inspiration in them, too. SSD Ringo is now in Virginia! Two members of the Bureau of Alcohol, Tobacco, Firearms and Explosives (ATF) came to the kennel today to meet Ringo and see if he might be a good fit for their training program. Once he goes through their program, he could become an explosive or accelerant detection dog. 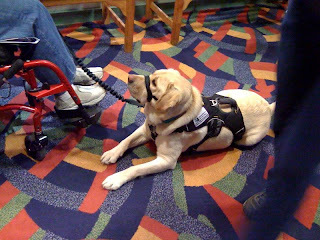 Ringo is a great dog, but becoming a service dog was not the right career for him, and he would not have been happy. But the same qualities that make him unsuited to service dog work, such as excessive sniffing, make him perfect for detecting explosives or accelerants. When the members of ATF met Ringo, they were looking for certain qualities. They want their dogs to be well socialized, trainable, have high energy, have little or no fear, and of course, love smells, among other things. With his love of smells and high energy, we think Ringo will be very happy with ATF. We wish him luck! We'll miss him, but we're glad that he's now training for a career that fits him. As our service dogs-in-training grow and gain more experience, they sometimes get into mischief. On last Monday night, Nubble got into a bit of mischief. He ate baking soda! He mauled the box, and since Donna wasn't sure how much baking soda he ate or what baking soda could even do to a dog, she called our puppy coordinator. As it turns out, Nubble spent Monday night at the vet's office, just in case his electrolytes were out of balance and to make sure his liver wasn't affected. Good news - he's perfectly fine! He did have two unusual side effects, though. He drooled constantly, so much that when he shook, the drool went flying. And his breath smelled terrible! We're all thankful, though, that these were the only side effects! With the support of Meg, the Northeast Division's coordinator, Nubble did pretty well at the casino. As long as Donna kept his attention, he behaved very nicely. She has determined that his biggest challenge when he's working in public is the presence of other dogs. When there are other dogs around, Nubble has a hard time concentrating because he gets so excited. Without other dogs, he does great! This is one thing that Donna plans to work on. Although he bolted to the top when there were only about eight steps left to go, he still made wonderful progress. Nubble drew lots of attention while he practiced stairs. "Everyone walking up and down the stairs was cheering him on, saying things like 'You can do it!' "Good job, puppy!' and 'You're almost there!'" says Donna. "It was really nice." Because she was running low on treats, Donna gave Nubble lots of praise until they got back to the car. Then she gave him a jackpot of treats so he would know he did an awesome job. Naturally, all that work tired him out and he promptly fell asleep. While Donna fills up her gas tank, Nubble has gotten very good at just sitting in the car watching her. He used to roam around the car and check everything out, but now when she tells him to stay, he sits nicely on the front seat. They still need to work on stay when Donna moves out of his sight. Right now, he gets up and moves to where he can see her. But it's nice progress. Donna works in a restaurant, and Nubble went with her to an employee meeting. They were a little late for the meeting because taking a puppy anywhere is sort of like taking a toddler. You need the puppy's vest, clean up supplies in case of accidents, clicker, treats, maybe a bone, etc. As as is often the case, breaks to get busy take twice as long when you need to be somewhere by a certain time. On the way inside, Nubble started making little growling noises. At first, Donna couldn't figure out what was bothering him because there didn't seem to be anything nearby that would cause that reaction. Then she saw that he was looking at a fire hydrant and realized that he probably had never seen one before. (Donna plans to take him walking in town more often.) He was dancing around, not getting close to it, but after she worked with him, he finally got curious enough to go up to it. After all that, he simply sniffed it and walked away. He didn't seem to care about the fire hydrant after that. During the meeting, Nubble had another new experience: applause. The first time all the employees clapped, he jumped up from his down, faced everyone, and joined in with his own loud noises. The second time, he jumped up but only looked at everyone. The third time, he was already standing but he just looked and wagged his tail. The fourth time, he stayed down and just turned his head to look at everyone. Nice progress! They went to Wal-Mart again, and this time Nubble did much better! Meg gave Donna some tips on keeping Nubble focused, and it has really worked. He was very well behaved and was not stressed this time. Donna still had to tell him to leave it a lot, but he did leave it when cued. He walked nicely on a loose leash, and when he did start pulling, Donna was able to quickly refocus him. His focus has really improved. Now when someone comes up and tries to get his attention or pet him, he looks at the people but then turns right to Donna. With the warmer weather, Nubble has turned into a shedding machine! But even though there's lots of hair to clean up, he and his puppy raisers are having a great time! Once a year, we take all of our breeding dogs to the eye clinic to have their eyes examined. We always to go to a visiting eye clinic to see Dr. Riis, a veterinary ophthalmologist who is extremely knowledgeable and understands assistance dogs. It's very important that service dogs be in top physical condition, including their eyes, and Dr. Riis is able to tell us whether any eye conditions will affect the dogs' careers as working dogs. This year, we took our breeding dogs as well as our new puppies and a few of the dogs-in-training that needed to be rechecked. SSD Pearl, Midge, Dixie, Fire, Rio, Aspen, Rusty, Onyx, Slate, Shamrock and Cabo had their eyes checked. When the dogs first arrived at the eye clinic, which was held at the Dauphin Dog Training Club over PawsAbilities weekend, they had their eyes dilated. Dr. Riis then examined each dog. If an eye condition is discovered, we ask several important questions. First, we want to know how it will affect the dog's health. How will the condition affect the dog's ability to work as a service dog? How will the eye condition affect the dog's partner once they're matched? (Meaning, will the dog's eye condition worsen at some point in the future, requiring the partner to bring the dog in for additional veterinary care or even causing the dog's early retirement?) Finally, if the dog is a breeding dog, we ask if the dog can be bred without passing on any eye conditions. 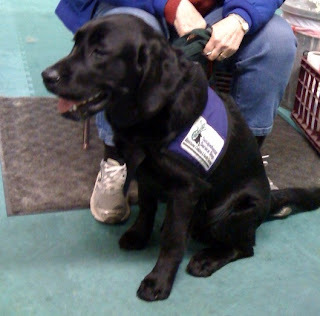 Our goal is to make sure all of our breeding dogs and potential service dogs are healthy. 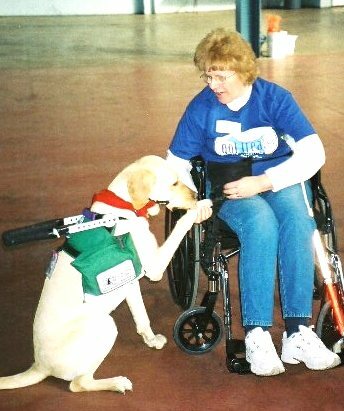 When we place service dogs with partners, our hope is that the dogs will be able to work with their partner for 8-10 years. We have good news! All of our dogs passed their exam! Thank you so much to Dr. Riis and everyone who helped at the eye clinic! Nubble loved coming to PawsAbilities! He even got his paw stamped! Although Donna and Lindsey didn't enter him in any Dog Olympics, he enjoyed just walking around. He really loved being around the other dogs, especially the big dogs. He met SSD Thunder, Sunshine and Iris. While they were at PawsAbilities, Nubble met his grandmother! 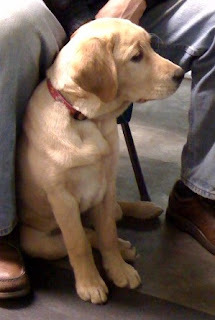 She is a hunting retrieving dog with the Northern Piedmont Retriever Club. 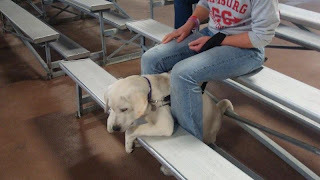 Nubble sat on the bleachers and watched her retrieve, and then Tom, Nubble's grandmother's handler, asked if Nubble wanted to try retrieving. 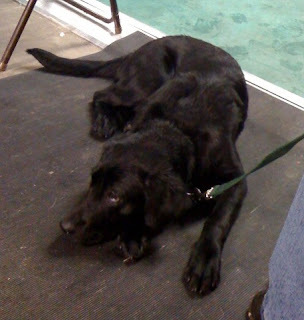 So Nubble got to romp around in the demo ring and practice retrieving! Such a fun time! He went to the bank with Donna, and every time they go, they practice under. Nubble has gotten pretty good at it. He goes under the table where you fill out your deposit slip and lays down. For some reason, he loves the floor at the bank. He always flops onto his back and rolls around a bit. Donna isn't sure whether he just likes the coolness of the floor or if he's excited because he knows he gets a biscuit at the end of the visit. He went in a public restroom this week. As a service dog, he would accompany his partner everywhere, including public restrooms, so it is important that he is comfortable there. He did fine while he was in the stall. While his puppy raiser washed her hands, he practiced under. Then, as she dried her hands, he stuck his head under the hand dryer. What a surprise! The noise didn't bother him, but the hot air definitely surprised him! It didn't bother him too much, though, because he stuck his head back under it. This past week, Donna and Lindsey have been working on heel. They had been using the purple box and shaping him to work his way around it, and now, they're working on heel without the box. Although he doesn't heel as quickly as some of the older dogs-in-training, he is definitely making progress. They've also been working on stay. So far, Nubble is progressing nicely. He has learned to stay when Donna walks through a door. Staying when she moves out of his line of vision is much more challenging for him, but they're working on it. At puppy class, the Northeast Division coordinator brought a kennel to practice kennel behavior with the dogs. The dogs are trained to go into the crate on the cue kennel. Well, Nubble is really good at it because when she asked the group "Do all the dogs kennel on cue? 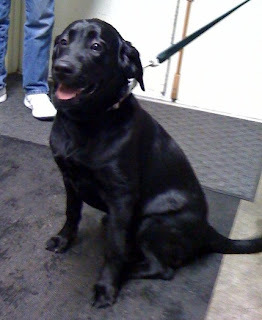 ", Nubble ran right into the kennel and sat down facing everyone! Once a dog was in the kennel, they practiced stay with the kennel door open. To increase the difficulty, other dogs were walked past the kennel door. The addition of the dogs walking by was a huge distraction for Nubble, but he did pretty well with stay. The kennel is a safe place for the dogs to relax. Although Nubble doesn't go into his kennel at home without being cued, he does go into Gizzy's kennel - sometimes while she's inside, too! Nubble loves spending time outside. Donna took him for a nice long walk this week and discovered that he's much better behaved when Gizzy doesn't come along. This is a bit of a challenge because both dogs need their walks, but there's not always time to walk them separately. Eventually, Nubble will get to the point where he can walk with other dogs without getting too distracted. With spring arriving, the robins and other birds have been hopping around the yard, at least until Nubble chases them away. He hasn't had much exposure to birds, so they are still a novelty to him. We'll keep you posted on his progress as he gets used to spring. Enjoy the warmer weather with your dogs! 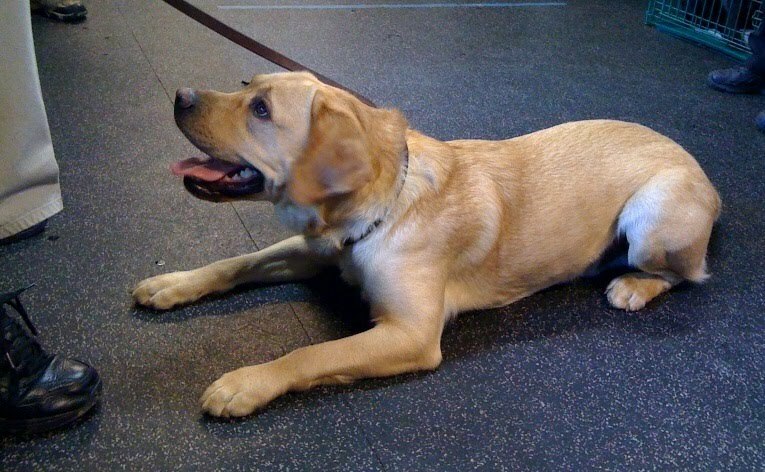 SSD Aladdin has returned to advanced training after being out on medical leave. (He and two of his brothers, SSD Phillip and Caspian, had had surgery to correct Cauda Equina Syndrome.) He will spend his weekdays at the SSD kennel learning service dog skills, and he may eventually be placed with a partner and become a working service dogs. On weekends, though, he still goes home with his puppy raiser. Because of PawsAbilities weekend, Aladdin and the other dogs had a short week at the kennel. 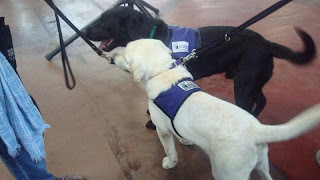 They returned home to their puppy raisers for an extended weekend while we prepared for the big event. 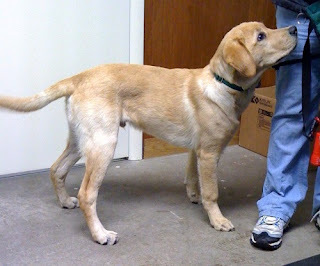 For the past month or so, Aladdin's puppy raisers have been getting him ready to return to advanced training. 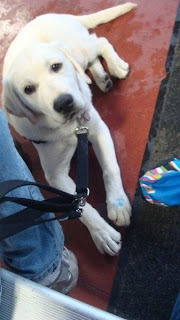 Cindy, his puppy raiser, has been taking him on several outings to practice loose leash walking and behaviors in public. Their first trip was to the grocery store. Because of his surgery, it had been a little while since Aladdin went out in public, and this first trip was very short. As soon as they walked through the door, he grew very stressed. Cindy took him to a quiet corner of the store and simply worked on his attention to her, an exercise to calm him and help him focus. After a few minutes, though, she realized he was still stressed, so they went home. One week later, Cindy took him out in public again. This time, they went to PetSmart, which is a very challenging outing for him. But after a little while, he did great! When they first got to the store, Aladdin didn't want to pay attention to Cindy at all. He loves to play with other dogs, so he was very distracted. Cindy sat outside on the pavement with him, and then they slowly worked their way through the door. They avoided the treat aisle because Aladdin tries to pick out all the treats he thinks he should have. He showed no signs of stress until they had been working inside for 10 minutes. Then Cindy moved him to a quiet corner and working on attention to calm and focus him. Soon, he was doing very well! For his next outing, they went to the movie theater in the mall! Aladdin did great in the mall! In order to get to the theater, they had to ride a glass elevator. At first, he wasn't too keen on the elevator, but Cindy put him in a down and gave him lots of treats, which helped a lot. Once inside the theater, he settled right down and made himself comfortable. About an hour into the movie, he began to get restless, so Cindy took him out for a break. When they returned to the movie, he went right back to sleep. In the movie, there was a loud gun shot, which made Cindy and her daughter jump, but Aladdin kept right on sleeping! Wonderful! For the next several months, Aladdin will be in advanced training. We'll post more about his weekend outings with his puppy raisers in the coming weeks. What a weekend! We had so much fun at PawsAbilities, and we hope you did, too! All the fun started at 8 a.m. on Saturday and Sunday at the Farm Show Complex in Harrisburg, PA. Our canine and human guests shopped at the many vendors, who were selling colorful bandanas, leashes, collars, pet photos, all sorts of delicious dog treats and food, dog toys - everything you can imagine for your dog. Dogs and their handlers played the Dog Olympic Games, where they squeezed under the limbo stick, played musical hoops, and tested their ability to clean their plate. Watch a video of some of our Olympic Games. For the first time, we held the Cutest Dog Contest, and there were so many cute dogs, it was tough to pick the cutest! This little guy was just one of the many entrants in the contest. The Appalachian Air Canines caught more frisbees than we could count! The Ultimate Air Dogs made a huge splash as they leaped off the dock! K9 Loki and her handler, Detective Dennis Woodring, made another appearance. 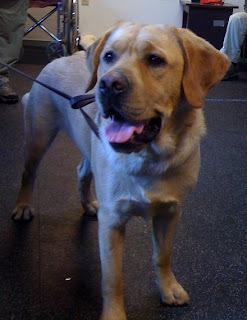 Loki is an accelerant detection dog, trained to detect accelerants such as gasoline and kerosene, among others. When she smells an accelerant, she lets Detective Woodring know by sitting. Once again, we held our Great Biscuit Bite-Off! Our service dogs and service dogs-in-training judged homemade dog treats. SSD Devon, Cinderella, Caspian, Slate and Graham Cracker judged the finalists. Watch the video. At the end of each day, we held the Abrams & Weakley Parade! All dogs, large and small, paraded around the Main Hall. What a great way to end the day! Watch the video. These are just a few of the fun things to do at PawsAbilities. We hope you'll join us next year for even more fun! PawsAbilities weekend starts tomorrow! Are you as excited as we are? The fun begins at 8 a.m. and by 9 a.m., canine Olympians are already competing in the Dog Olympics! Just come to the Olympic Registration table to sign your dog up to play. There will be lots of fun and interesting demonstrations throughout the weekend. We will be doing demos on clicker training and service dogs. You'll also be able to see the accelerant detection dog Loki, a hunting retriever demo by the Northern Piedmont Retriever Club, and the canine freestyle of the Steppin' Woofs! The bloodhounds of Summit Search and Rescue will demonstrate their tracking abilities and Appalachian Air Canines will catch more frisbees than you can count! And don't forget about the Ultimate Air Dogs! They'll be making a splash at PawsAbilities. Participate in the Cutest Dog Contest, the costume contest and the Abrams & Weakley Parade! 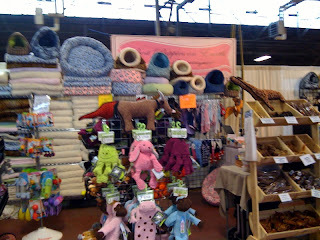 Check out the vendors in the Canine Marketplace. And most of all, come and have fun with your dog! Tickets are $10 for adults, $5 for children, and they're good for the entire weekend. We hope to see you there! Directions and more are available on www.pawsabilities.net. Every other Wednesday, our puppy raisers bring their puppies to puppy class. Puppy raisers and puppies have a chance to demonstrate what they have learned in the past two weeks. Our trainers teach new methods for teaching the dogs behaviors, and then we give everyone a chance to practice the new skills. Because each puppy learns at their own pace and may be at a different place in their training, our trainers spend some time with each puppy raiser to give them suggestions for working with their puppy. This week, we started class with puppy massage. The puppies are usually very excited for puppy class because they get to see all the other dogs, but puppy massage helps calm them down a bit. It helps relax the puppy raisers, too! 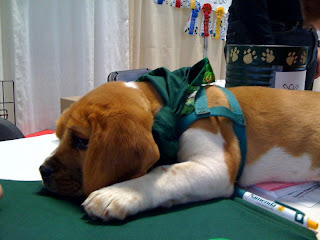 In puppy massage, puppy raisers move through the green, yellow and red areas on the puppy. The green areas are the places the puppy loves to be touched; the red areas are the places where the puppy doesn't really like to be touched. For example, a dog's green area might be his ears, and a red area might be his paws. In puppy massage, you would massage his ears, then just slide your hands down to his feet and back up to his ears. This will help him get used to being touched in those red areas. At the last puppy class, we gave the puppy raisers leave it homework. Puppies were supposed to start working up to a 15 second leave it when food is dropped on the floor. They were also supposed to practice leave it when walking by food. In this video, SSD Misty Morning demonstrates walking by food on the floor. (We used a pile of kibble.) Notice how she definitely knows the food is on the floor, but she chooses to look up at her handler. Every time she looks up at him, she gets a click and a treat. This exercise trains the dogs to ignore food on the floor and pay attention to their handler, which will allow them to go places like restaurants or the produce aisle at the grocery store without lunging for dropped food. One of our trainers demonstrated the "soccer" method of blocking the dog from getting to food, another dog, or anything it wants. You use your body to block the dog, similar to the way you would stop a soccer ball. (Do not kick the dog. Just move so your body is between the dog and the item it wants.) The goal is to prevent the dog from getting the item and to teach self control, so that he will look to his handler rather than lunge for the item he wants. Eventually, the dog will be able to walk right past food without a problem. 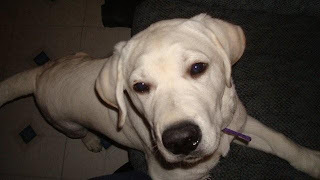 In this video, SSD Onyx and her puppy raiser practice the "soccer" method. Carol, one of Onyx's puppy raisers, is blocking Onyx from getting to the other dogs. Very quickly, Onyx stops trying to get around Carol and sits and looks up at her. The puppies are also learning visit. In the finished behavior, the dogs will rest their head on a person's lap when given the visit cue. The puppies start by hand targeting, gradually increasing the time they rest their head on their handler's hand. In this video, SSD Star, Cabo and Sunshine demonstrate their progress with visit. We're looking forward to seeing what all the puppies learn over the next two weeks! Some of these puppies will be at PawsAbilities this weekend, so be sure to come to the Farm Show Complex to join in the fun! When you come to PawsAbilities this year, make sure to stop by the Dogs Change Lives booth! You'll be able to read and vote on your favorite stories. And if you have a story about a great dog, you can submit your stories right there at the big event! Plus, you could find your story up on the big screen! We'll be rotating through the stories so that everyone has the chance to read about all the great dogs out there. We'll see you on Saturday and Sunday at the Farm Show Complex in Harrisburg, PA! 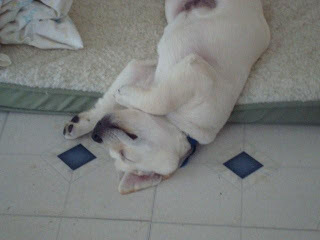 Nubble Is One Active Puppy! Nubble is one active puppy! 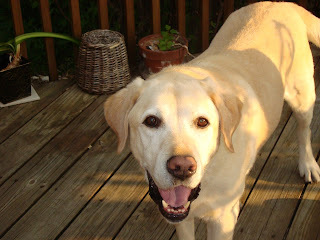 Last week, Donna took him out for a run, and he did some awesome loose leash running! Even though he's capable of running faster than Donna, he chose not to and stayed by her side. While they were out, a school bus passed them, but Nubble just sat and watched it. He slept most of the way home, but still had plenty of energy left to play with Gizzy! This past weekend, Donna and Lindsey took Nubble and Gizzy for a walk on a wooded path. This time, though, Nubble wasn't interested in loose leash walking. All he wanted to do was pull ahead, straining the leash. He didn't even care about treats. Finally, Lindsey ran with him for a bit, and after he burned off some energy, he settled down. Lindsey ran with him periodically throughout their walk to keep him focused. He was able to greet two other dogs very nicely. He also encountered a young boy, whom he just wanted to play with, and a few bicycles. Before the second bicycle passed, Donna had Nubble sit and watch, and he was fairly calm, considering hos excited he was on this walk. Nubble finds geese fascinating. When he sees them, he just stares and follows them with his eyes. They don't seem to bother him at all. At the end of their walk in the woods, Donna and Lindsey let the dogs get a drink from the slow-moving creek. Gizzy loves doing this, but it was Nubble's first time. He was on the flexi-leash, which is a good thing because he started romping around in the water, and pretty soon, he was swimming! He must have been a little surprised that he could swim because once he got out, he patted the water before he'd walk back in. Of course, after all that swimming, Nubble looked like a chocolate lab. Donna keeps a crate in her car for situations like this, so Nubble didn't get the car all dirty. As soon as they got home, it was bath time for him. Nubble was on his best behavior for his bath. He just stood in the tub and let Donna and Lindsey wash him. By the time they were done, he was dozing in Donna's arms. Like most dogs, though, he waited until he was out of the tub and right next to people before he shook off. Donna learned very early to shut the bathroom door so the spray is contained in one room, at least. After all that excitement, Nubble settled into a nice nap. Donna and Lindsey have been working on under, heel, off and leave it. Always, they try to reinforce good behaviors. This is one of the reasons why our puppy raisers are such an important part of our puppies' lives. They teach the dogs good manners and self control very early in life, which means the dogs will have a much greater chance of success when they enter advanced training. Despite the fact that Nubble occasionally steals a stick of butter off the counter and sometimes tries to pick up dead mice, Donna and Lindsey love having him. "I enjoy the time I get to spend with both dogs. I just wish there was more time in the day," says Donna. "I'm looking forward to spring and warm weather with the dogs." Last week we held an orientation for our new puppy raisers. Although we don't have any puppies right now, we're hoping to have some soon, and when that happens, we'll need lots of people to raise them! Our puppy raisers are very important volunteers. They volunteer to welcome an 8-week-old puppy into their home and raise it for the next 18 months, preparing it to enter advanced training. Puppy raisers are responsible for house-training, teaching the puppy good manners, self control, and cues, taking the puppy to all sorts of new places and attending puppy classes and outings. We are with you every step of the way. Each new puppy raiser is paired with a mentor - a veteran SSD puppy raiser - who will be available to answer questions and share tips and advice. SSD staff are always willing to answer questions and give private lessons. We want you and the puppy to have the best experience together. 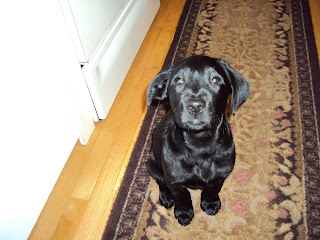 If you're interested in being a puppy raiser, visit our website. We would love to have you join our SSD team! PawsAbilities weekend is next week (March 13-14)! Have you bought your tickets yet? Monday, March 8 is the last day to buy tickets online, but you will be able to buy tickets at the door. What can you do at PawsAbilities? You'll have so many choices! 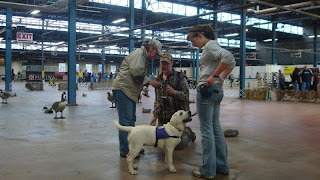 Visit www.pawsabilities.net to learn about everything there is to do all weekend. Just sign up at the Abrams & Weakley booth. It's FREE to join the parade! Next week, look for more posts about all the fun things you can do at PawsAbilities! We hope to see you there! Team Training ended yesterday, and we have great news! All of the teams who have gone through training these past two and a half weeks have passed their public access test! They are now officially service dog teams. On Tuesday, SSD Gnat, Lil, Natalie and their partners went to the Whitaker Center for Science and the Arts in Harrisburg, PA. With all of the interactive science exhibits and children running around, it was a fun but challenging outing. When the partners and their dogs first entered the exhibit, many of the children wanted to pet the dogs. What a great opportunity to practice greetings! By giving lots of treats, each partner kept their dog focused on them while the kids crowded around. Natalie is specially trained to find her young partner if he wanders off. She follows the cone of scent, zig-zagging until she finds the strongest trail, and then she follows it. 'It's like fishing," says her partner's father. "You can feel it through the leash when she has the trail." Right now, she's following the scent of vanilla, which we use in training, but that scent will gradually be tapered off and replaced by her partner's scent. Natalie wears a special harness with a handle that her young partner holds on to. If he starts to wander while he's still holding the handle, Natalie will brace and pull him back. At the cue from her partner, she goes under the bench, where she lays down out of everyone's way. As each person went through the exhibits, the dogs gained many new experiences. In the Carnival of Health exhibit, Lil and Gnat got a surprise when their partners played the Icky the Clown game (similar to Whac-A-Mole). The dogs were laying nicely beneath the clown's nose while their partners played. At the end of the game, the clown sneezed and sprayed the dogs with goo! Lil didn't seem to have a problem with it, but Gnat didn't like it too much. He recovered quickly, though, after his partner wiped him off. Later, Gnat practiced pulling his partner, who uses a wheelchair, and they glided across the floor effortlessly. It was a wonderful outing, and we had a lot of fun! 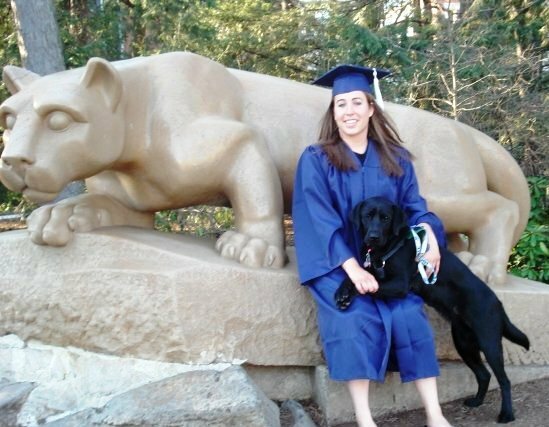 We're so glad that all of the partners and their service dogs are now official working service dog teams! "I'm so happy," says SSD Gnat's partner. "Having a service dog is the best thing that ever happened to me. It's like having my life back." Nubble had his first elevator ride this past week. His puppy raiser, Donna, wasn't sure how he would react, but he didn't seem to mind it at all. Stairs are a different story, though. Donna doesn't have stairs in her house, except in her basement, and Nubble refuses to use them. While they were at a department store, Donna decided to practice stairs with him. Unlike the basement, these stairs were wide and well lit. Nubble was still very intimidated by the stairs. By clicking and treating, Donna got him to put his front feet on the stairs, but he didn't want to put his back feet up. At one point, he bolted up seven stairs and came right back down. By the time they left, he was able to do three or four steps. Donna plans to spend more time working on stairs with him. He also went to the hair salon, but no, he didn't get his fur done! While Lindsey got her hair cut, Nubble practiced sitting patiently at Donna's feet. She had to tell him to leave it with the hair on the floor and the hairdresser's shoes, but he was very well behaved. 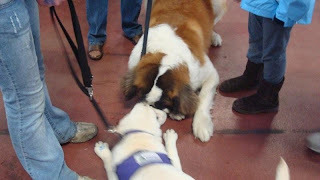 Last week, SSD's Northeast Division went on a puppy outing to Wegmans. Nubble loves grocery shopping, and he really enjoys being out in public. Although he behaves differently when there are other dogs around, he did very well on this outing. The amount of exercise Nubble gets affects his attention span. He pays more attention to his puppy raisers after he has worked off some excess energy. When Donna took him to a weight loss class, she let him run and play in the parking lot first (being extra careful of cars, of course). After that, he settled quietly at her feet during class. At one point, he crawled under her chair and just watched everyone. He did have one new experience at the class. Nubble has not been around little kids very much, but he met a toddler that night. The little boy loved dogs and wanted to pet Nubble. Nubble just wanted to jump all over the little boy. Fortunately, the little boy wasn't afraid of this yellow lab and kept coming back to pet him - which was great for Nubble. Donna plans on giving him more experience with little kids. Donna's brother has two Shih Tzus (Angel and Sparky), and Nubble got to meet them. Donna and her brother introduced the dogs slowly, giving them plenty of time to get used to each other. It went very well, although Nubble just wanted to play with Angel, and Angel just wanted to be left alone. Sparky was a little timid around Nubble, who tends to play rough. But Nubble was not aggressive at all. He just wanted to play. Donna and her brother are going to keep working on it. Besides going out in public, Donna has been working on loose leash walking. Sometimes Nubble is great about it, and other times he practicatlly pulls Donna's arm out of its socket! But he's starting to get the idea, and soon he'll really catch on. He now loves to play keep-away. If he picks up something he knows he shouldn't have, he runs away, either to another room of the house or to his crate. If he's outside and off leash, he runs and stops just out of reach. When he plays keep-away, Donna has been ignoring him so he gets the idea that this is not a fun game. So far, it seems to be working, but it is frustrating for the puppy raisers. Gizzy, the family pet, likes to help out. When Nubble takes a glove or slipper in the house, Gizzy barks and growls for him to leave it. Look for more about Nubble next week! Vote Today for Your Dogs Change Lives Story! Today is the first day of voting for Dogs Change Lives! Visit www.dogschangelives.org/stories and vote for your favorite story! You'll be able to vote from today through March 28. The story with the most votes by midnight on March 28 will win $1,000! You can vote once a day, so make sure you share the link to your story and tell your friends to vote. If you haven't submitted your story yet, don't worry. We extended the deadline for story submissions to March 14. So submit your story today, so you have lots of time to for people to vote for your story! You'll be able to vote and submit your stories at PawsAbilities on March 13-14 at the Farm Show Complex. Just look for the Dogs Change Lives booth.